It’s not every day that you have the honor of sitting on the floor of the cafeteria at the National Geographic Society with one of the magazine’s first female photographers to discuss how communicating through images can change the world. But that’s exactly what I did with Annie Griffiths for the fourth episode of the Social Strategist. “I spend a lot of time on the floor anyway,” Annie joked during the interview. Annie is famous for her inspiring images which have graced the pages of National Geographic, other well-known magazines and book projects. She has worked in more than 100 countries around the world and has used the power of photography to tell some the most heartbreaking and heartwarming stories imaginable. Annie’s approach to her work evolved over time as she began to focus on the plight of women, especially in developing countries. “I came to a point where I wanted my photographs to be useful as well as beautiful,” Annie explained. 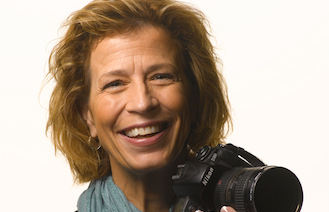 To accomplish her mission Annie helped to create Ripple Effect Images, a group of journalists who donate their time and photographs to international organizations working to empower women and girls through programing. The tagline of Ripple Effect Images is a simple yet powerful one: Help a woman. Help the Planet. “We think so often that women are seen as victims. And if you work with poor women you realize they have no interest in being victims. They are the most resilient, smart, hardworking, hopeful people on Earth and they pay it forward to society,” Annie says. In short: women can create a positive ripple effect of social change in their communities and Ripple Effect Images is using strategic imagery to tell these important stories. What makes a good photo that speaks for itself? How can cause-based communicators use photos to better tell the stories of their organizations in an effective way? Can photos really lead to social change? "We think so often that women are seen as victims. If you work with poor women you realize they have no interest in being victims. They are the most resilient, smart, hardworking people on Earth and they pay it forward to society."